The set for this tour (see below) is made up entirely of songs from the Free catalog; however, Rodgers had a surprise up his sleeve as the first song of his encore. 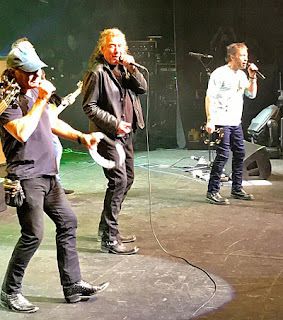 Bringing out Robert Plant and former AC/DC vocalist Brian Johnson, he launched into a blistering take on Barrett Strong's Money (That's What I Want). For Johnson, it was a return to the stage after the March 2016 announcement that doctor's had advised him to quit performing immediately or risk total hearing loss. He has since been working with Asius Technologies on a new technology that will improve his hearing and allow him to return to performing. Here is fan shot video of the performance.